Like their fellow hitchhiker-turned-aquarium-stars, the Mantis Shrimp, Pistol Shrimp are coming into their own as popular aquarium additions. Unlike the Mantis Shrimp, most Pistol Shrimp can actually be kept with other tankmates. They may even form bonds with some tankmates like Shrimpgobies that can be fascinating and entertaining to watch. 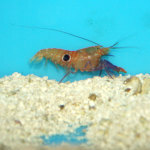 Here are a few species of popular Pistol Shrimp for home aquariums. Pistol shrimp get their name from the loud popping sound they can make by quickly opening or closing their specially adapted claws. This is used as a defense mechanism to frighten off would-be predators and, unlike the Mantis Shrimp they are sometimes confused with, they are harmless to most tankmates. 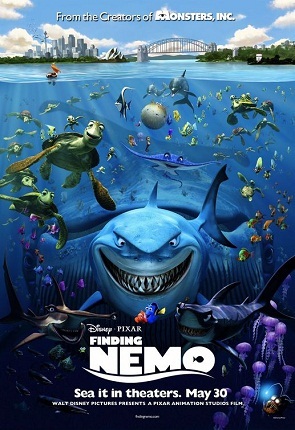 They can be kept with most fish that will not prey on them but should not be kept with some other crustaceans, especially small shrimp or lobsters. The Tiger Pistol Shrimp is one of the most common and most popular pistol shrimp. It’s one of the species we get in to our store most often. 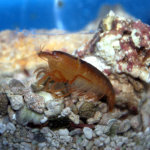 These shrimp aren’t as striped as one would expect from a “Tiger” Pistol Shrimp but has a mottled, vaguely striped coloration in shades of tan, cream and reddish brown. The legs are striped and its claws have dark bands like the rubber bands on the claws of a lobster at a seafood restaurant. These pistols are true commensal species and may bond with any shrimpgobies – genus Cryptocentrus, Amblyeleotris, Stonogobiops and others. This species can grow up to about three inches in length and is one of the larger pistols. The Randall’s Pistol Shrimp is also known as the “Candy Cane” or “Red-banded Pistol Shrimp” and is one of the other species that we get in most often. While the Tiger Pistol Shrimp has a more mottled pattern, the Randall’s Pistol has more solid bright red and white stripes over a somewhat translucent body. The body and legs may be yellow – sometimes bright yellow – in some shrimp. This pistol shrimp only grows to about an inch and a half in length but, like the Tiger Pistol, isn’t too picky about which shrimpgoby it forms a pair with. It is better for smaller nano-reefs than the Tiger Pistol Shrimp. These pistol shrimp aren’t usually identified down to the exact species since several different species are almost identical. All are red with white markings, some with purple accents or banded antennas. However, these shrimp don’t usually pair with shrimpgobies. Instead, they form a relationship with the Curlycue Anemone (Bartholomea annulata), a common Caribbean anemone with long spiraling tentacles. The Green Pistol Shrimp is one of the more understated species. 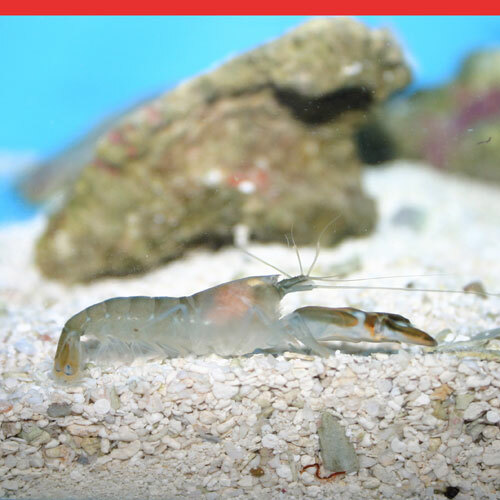 These shrimp have a brownish, olive green color more suited to the environment where they live. Rather than the rocky coral reefs of many others, the Green Pistol is found in muddy estuaries at the mouths of rivers, usually in full saltwater but some can tolerate the more brackish waters closer to the bays and mouths of the rivers. These shrimp are best kept in tanks with deeper, finer substrate closer to the muddy bottoms they have come from. Pocillopora Pistol Shrimp are fascinating and rare pistols with a different modus operandi than other pistols. Like its common name suggests, these shrimp live within Pocillopora colonies. They will sometimes live alongside other coral-dwellers like Trapezia crabs where they may even work together to fend off attacks from coral-eating starfish like Cushion Stars or Crown Of Thorn Stars. They stay fairly small, usually well under two inches, and can vary in color. Most are yellow-orange with purple markings like speckles or a stripe down their back. Some of these may be regional variations, others may be subspecies. 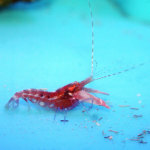 The Bullseye Pistol Shrimp is one of the most stunning in appearance. The body is bright yellow-orange and the claws, legs and antennae are bright purple. 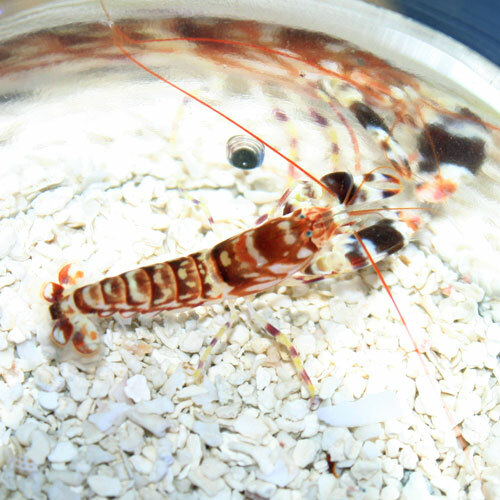 Although they are also sometimes known as “Michael’s Pistol Shrimp”, the name Bullseye Pistol Shrimp comes from the white-ringed black spot on the middle of each side. This pistol shrimp is another that doesn’t usually form a bond with shrimpgobies. 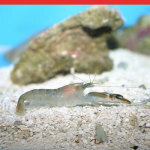 Some may share a burrow with some shrimpgobies, but they aren’t as reliant on the bond as other pistol shrimp and will often live on their own without a goby and may leave a pair at any time. This species also tends to be more active and will venture further from home and more into the open than others. 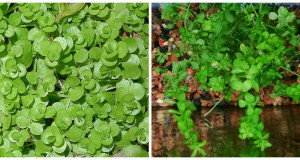 These species are just some of the more common to enter the aquarium hobby. Others are sometimes available as well and each have their own unique behaviors and appearances but all can make for fascinating additions to a saltwater aquarium! We are trying to save an African black clawed frog that was abandoned in an aquarium when his owners moved out of their apartment. Helpful veterinarian isn’t an amphibian specialist and we can’t travel into Boston. Some of our questions are not answered on the various Internet site for this species and we can’t afford to join those that sound as if they might be helpful. We need someone that can answer these questions. Appreciate any help. Thanks on behalf of Frogy. Hello Fluffer, I would recommend contacting our Reptile Room staff about your questions. You can reach them at 717-299-5691, extension 1246. Hello, great post. I have had a yellow watchman and a tiger pistol for about a few months, and both have been living enjoyable. 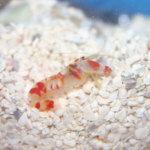 The Pistol Shrimp is among the best invertebrates in my tank. It likes to create caves under the rockwork and interact with my Watchman Goby. 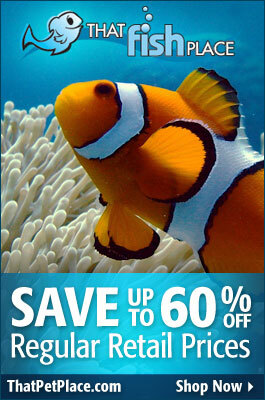 I would recommend this species to everyone who would like to add a new level of diversity to their saltwater aquarium. The only thing I’d recommend is to get a different species which has the same personality but more color.